The ANZAC Garden came about as part of the ANZAC Centenary Local Grants Program from the Federal Government. We were successful in getting a $15,000 grant to celebrate the centenary of the ANZACS. The vision was to have a place that students, parents and members of the community could come, visualise and remember the contribution of the ANZACS. Research showed that there were 14 ANZACS from the area of Pascoe Vale. After considerable investigation, we found out who they were, where they were sent, conditions they faced, modes of transport and what they were fighting for. We wanted somewhere that we could remember the past, encourage the present and embrace the future. The bike shelter was constructed as it was a common link between 1914 and 2016. The murals were constructed by Mr Theo Hartman – from Coburg High School with a group of his art students. 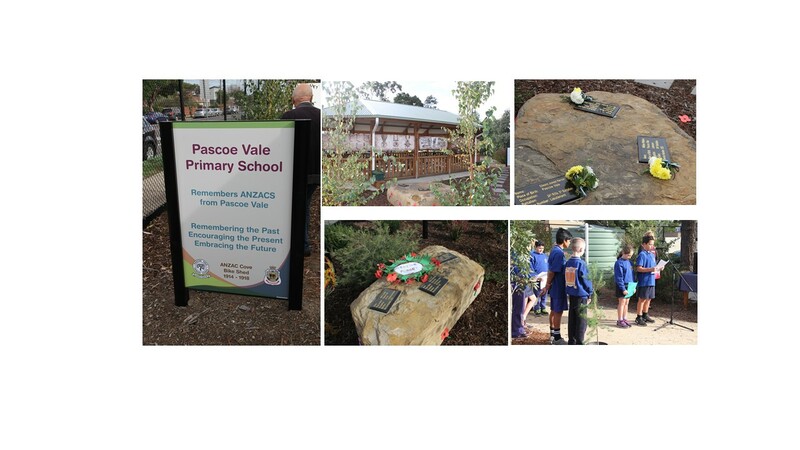 We wanted to create a mural that showed the journey of these Pascoe Valeian ANZACS. The memorial plaques were created by Cameo Memorials so that we could remember each of the 14 ANZACS. The garden and memorial walk through the garden was created with the great help from Mr Paul Greaves as we wanted to create a tranquil walk as we remembered the ANZACS. The ANZAC Garden is part of the Children’s Friendship Garden which is an area that we value, where students of all ages and nationalities can sit, garden, read, talk, and play with the chickens and take some time out of their busy day.